Provide free valuable content to your target audience. Retarget users who have engaged with your Facebook videos. Each Facebook ad campaign is made up of three parts. Choose from 11 Facebook advertising objectives. This ecommerce company is promoting a discount code lead magnet in a Facebook ad. The middle level of the Facebook campaign structure is where you choose your targeting, placement, budget, and schedule. Set basic demographic- and interest-based targeting at the ad set level. You can choose from a variety of detailed targeting options available at the ad set level. For example, suppose you’re a luxury retailer in the wedding industry. Start by targeting people interested in weddings and things related to weddings. If you’re a wedding retailer, target Weddings as an interest. Next, you want to narrow your audience using the AND condition. Click Narrow Audience and select the life event of people who are recently engaged. Use the Narrow Audience feature to zero in on your ideal customer. Custom audiences let you target people who have had some interaction with your business on Facebook, on your website, or in your email marketing. Custom audiences can deliver some of the best results for retargeting campaigns because you’re targeting warm audiences of people who already know, like, and trust your business. Click Create New and select Custom Audience. Choose from four Facebook custom audience categories. You can either upload your customer list or copy and paste it to create a Facebook custom audience. Create a website custom audience to retarget website visitors with Facebook ads. 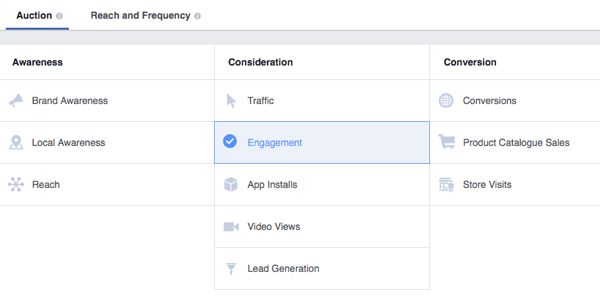 Facebook lets you create four engagement-based custom audiences. Create a Facebook lookalike audience based on an existing audience. The bottom level of the Facebook campaign structure is where you choose your ad creative. Select one of five different Facebook ad formats. Create multiple Facebook ads and split test their performance. What do you think? Have you used some of these tactics in successful campaigns? What tips can you offer? Please share your thoughts in the comments below.